Last September, as a new member of the Digité Marketing team, I was trying hard to understand Digité products and space which we are in. I was learning several new concepts including Lean, Agile, Application Lifecycle Management (ALM), Project Program Management, etc. where we have a bunch of powerful tools! That is when I heard the name of “Kanban”. I was already aware of Lean principles and their techniques because I got Lean certified in my previous company. However, I had not seen Kanban being applied to software development, project management, etc. The introduction to Kanban came during the 4-week induction training in Mumbai where we got a chance to get hands-on experience on SwiftKanban and SwiftEnterprise tools. 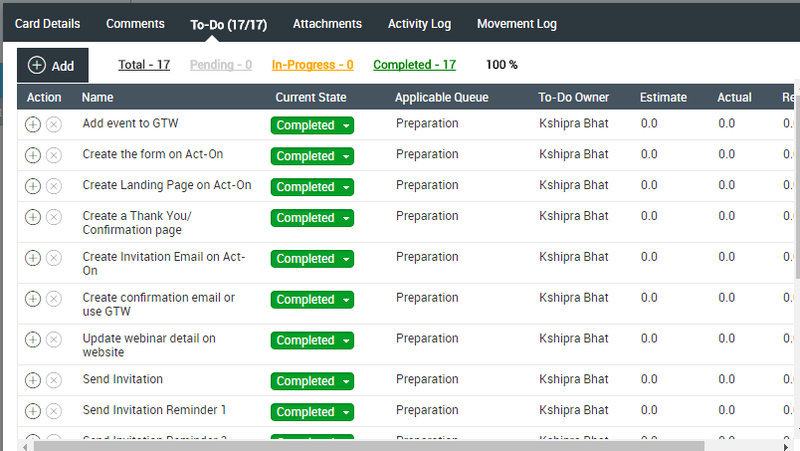 We were so carried away by the classy look and user-friendly interface of Swiftkanban that we took to it with gusto! We created a whole bunch of cards and assigned them to ourselves. Only later did I understand the importance of NOT having too many cards on the Kanban board (too much WIP!) or considering the “class of service” while prioritizing work for myself. I guess that was my initial foray into a “proto-kanban” implementation – I was still learning! Around the same time, I was fortunate enough get to attend the Lean Kanban India 2016 conference (LKIN) and listening to David J Anderson and other thought-leaders. I got to understand much better the application and benefits of the Kanban method for software Development and knowledge work. Putting my Knowledge to Test! After all the excitement during the training and the LKIN conference, I got to doing some actual work as part of the Digité Marketing team. Each one of us is assigned specific marketing responsibilities and we plan on campaigns for each of them. We have a daily stand-up meeting within the team where we make sure we don’t have anyone stuck with anything where they might need help. We review our work with the Head of Marketing on twice-a-week basis. Since we are a distributed team, we use Skype and GoToMeeting to keep in touch! Of course, we use Swiftkanban for prioritizing and working on specific marketing deliverables, as also to collaborate with other functions such as UI and Engineering! We plan our overall work in terms of key marketing Themes, Marketing campaigns, Deliverables, and Events. Each set is managed within a swim-lane on the same board. Events require greater planning and tracking and hence have their own swim-lane. 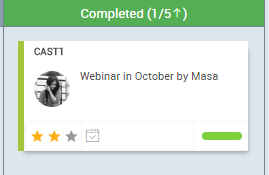 Themes and Campaign follows a simple workflow of Ready, In-Progress and Done – but they use our special “Portfolio Lane” so we can automatically track their progress in terms of % completion based on how many of their deliverables are completed. The Deliverables lane has – Backlog, Prioritized, In Progress, Review and Completed columns. Events have a slightly different workflow -Identified, Scheduled, Preparation, Execution, Post-event follow up and Completed. Events need scheduling and planning in more detail – and more follow-up. Overall prioritization takes place on an annual and quarterly basis at senior management levels. Based on the priorities set there, we identify and prioritize the work that the Marketing team must accomplish in Monthly Planning and Weekly Replenishment meetings at the team level. All work prioritized in a week is pulled into the Prioritized queue at the start of the week. Team members pull one of these cards from the Prioritized queue and work on it. Once completed, it is reviewed before being marked Done. The Done cards are archived once a month after reviewing with management. Based on the kind of work we were going to do, we created cards for each type of activity (Newsletter, Blogging, SEO, SMM, Webinar etc.). The card color identifies each type of work and is worked through the appropriate swim lanes. While Theme and Campaign cards go through their own swim lanes, their child cards go thru either the Deliverables lane or the Events lane. 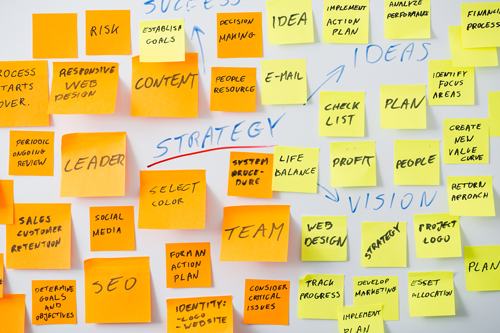 Here are the key advantages that I feel we have using Kanban in Marketing. Kanban greatly helps us in collaborating within our team and sharing ideas. Marketing depends on a number of other functions such as UI/ UX, Engineering and Sales for planning and doing its work. It makes it easy for us to communicate to the rest of the organization what we are working on at any point of time. All stakeholders and team members have clear visibility of the various activities the team is doing. It allows us to discuss among team members regularly and modify our processes to become more efficient. The challenge of having too much work and not having time to look back is eliminated in our team – thanks to that critical concept of WIP Limits. The idiom best explains this “One thing at a time and that done well.” We are encouraged to take up and complete one thing at a time. This improves the quality of my work since I concentrate on one thing at a time. The WIP Limits on the Kanban board offer a systematic approach to help implement and enforce this approach. We have specific WIP limits for each team member – no more than 2 cards at a time. Using this, we focus on completing the tasks at hand before taking up new work. This helps in keeping the work flowing and the board humming! I am sure you will agree, I have learned through my experience! At the end of the week or month, it gives us great satisfaction to be able to “see” what work we completed and what, if any, remains blocked. Using Kanban, we measure the average time it takes for us to do various type of tasks. 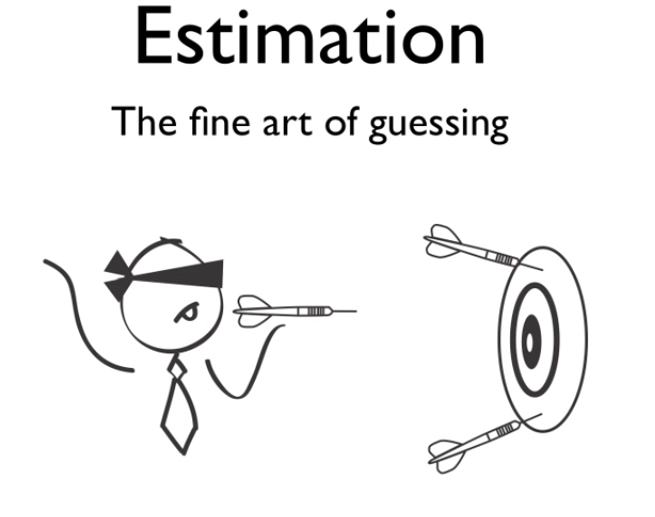 So, it helps us predict better the amount of time we might spend on an activity/ campaign. This also helps in prioritizing and ensuring that we first work on the critical tasks which may require more time/ effort to complete. Stakeholders get better visibility on the work the Marketing team does. First, the way we have structured the board, they have a clear picture of what key themes is the marketing team currently working on. Secondly, they get visual indications of exceptions such as Blocked cards and WIP Limit violations, so they can step in and help resolve such exceptions. Third, when tasks are completed and moved to the Review column, the senior management can review and get a quick feel of where each project stands. Finally, a look at the board analytics gives everyone a clear picture of how the marketing team is performing on things such as lead time, throughput, and campaign completion status. 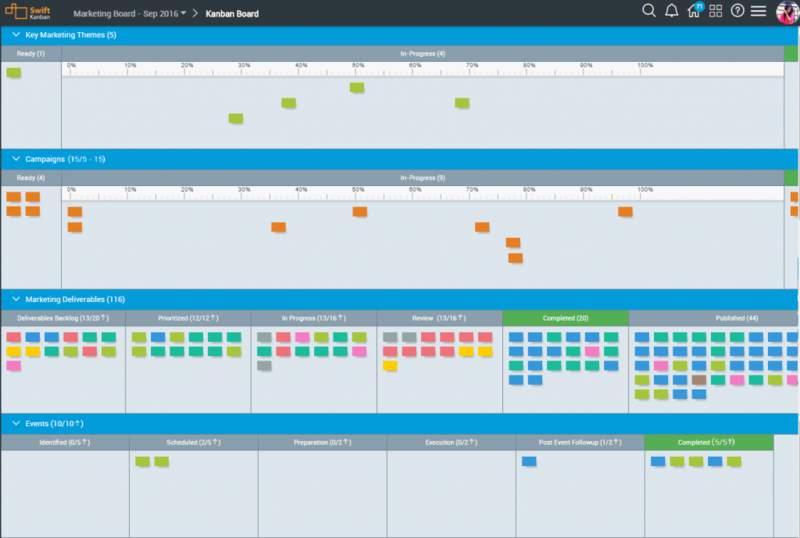 I feel Kanban is a great method for planning and organizing a marketing team’s work. In a product company, such as Digité, Marketing is a function that collaborates with and impacts key functions in an organization – Sales, Product Management, UI/UX and even Engineering, as key marketing milestones are dependent on product features/ releases. Kanban helps various teams understand the dependencies between teams and helps them collaborate much more effectively. Within a team, Kanban makes it easy for us to prioritize and work effectively on the most important work for the team and the company overall. 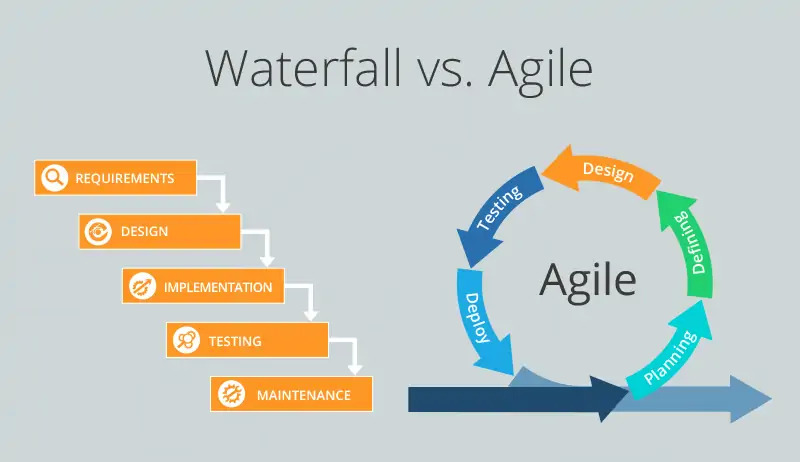 Please refer our Agile Marketing webinar video for more insights! 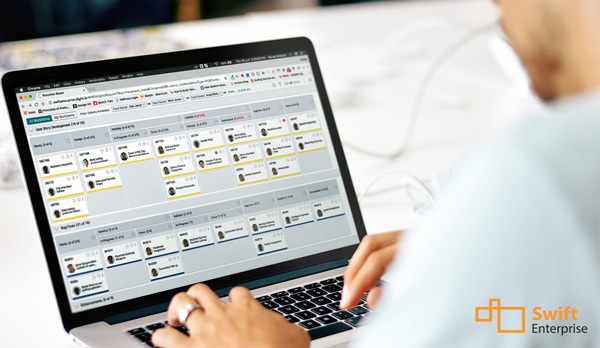 Signup for a FREE TRIAL of SwiftKanban and create your own Marketing Board. Kshipra Bhat - MBA graduate from PESIT, Kshipra brings nearly 2 years of experience in Marketing and operations. Prior to Digite, Kshipra was working with ``GE power and Water`` operations team. She is a passionate runner, loves analytics and enjoys craft making.